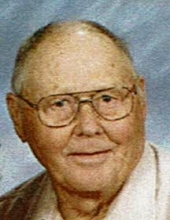 Carl Victor Anderson, long time Rugby, North Dakota resident died at Hawley Senior Living, Hawley, Minnesota on April 2,2019 at the age of 92. Carl was born the son of Swedish immigrants, Victor and Hilda Anderson, in Minneapolis, Minnesota on April 24, 1926. Following the death of his mother in 1928, he moved to the Rugby area to be raised by a family friend, Alice Turnquist. He lived with the Turnquist family on a farm south of Rugby. Often, he traveled to Minneapolis to visit his father. He graduated from Rugby High School in 1943. In 1944 he entered the military service, serving in the United States Army in the Asiatic-Pacific Theater during World War II. He was honorably discharged in 1946 and returned to Rugby. Carl married Alice Jean Dokken on September 25, 1949 in Rugby. He began his farming career with Anfin Tweet at Tunbridge, North Dakota, where he farmed from 1953 until 1987, eventually fulfilling his dream of owning his own farm. He was an active community member and a strong supporter of Rugby businesses. He served on the Ness Township School Board, Tunbridge Lutheran Church council and was a trustee of Bethany Lutheran Church in Rugby. Carl had a love of hunting and trap-shooting becoming a champion shooter. In retirement, Carl and Jean followed the southern trap-shooting circuit for approximately 40 years. They spent winters in Arizona, returning each spring to support his other love, farming. His trap-shooting awards included North Dakota Sportsman of the Year in 1994, North Dakota Trap Shooters Hall of Fame in 1999, and North Dakota State Champion in 2000. In addition to these state awards , he was a nationally ranked trap-shooter. Carl is survived by his wife, Jean, who lives at Hawley Senior Living. He also leaves two daughters, Karla (Gerard) Gwost – Harwood, North Dakota and Susan (Jim) Carpenter - Lake Park, Minnesota. He also leaves 6 grandchildren and 8 great-grandchildren. He was preceded in death by his parents, his foster mother, his son, Keith Douglas Anderson in 2014, and a granddaughter, Amanda Riddle. He looked forward to reuniting with his family in the surroundings of heaven. Funeral services will be held at Bethany Lutheran Church in Rugby on Friday, April 5, 2019 at 11:00 A.M. . Visitation will be held at the church after 9 AM at the church only. Casketbearers will be Jason Anderson, Andrew,Eric, and Matt Gwost, Justin Hewitt, Darrell Howard, Bruce Oksendahl, and Jim Teigen. Members of the Rugby Gun Club will serve as honorary casketbearers. Military honors will be provided by the Clarence Larson Post # 23 American Legion and the North Dakota Military Funeral Honors. Burial will be in the spring at Persilla Watts Cemetery - Rugby. To plant a tree in memory of Carl Victor Anderson, please visit our Tribute Store. "Email Address" would like to share the life celebration of Carl Victor Anderson. Click on the "link" to go to share a favorite memory or leave a condolence message for the family.